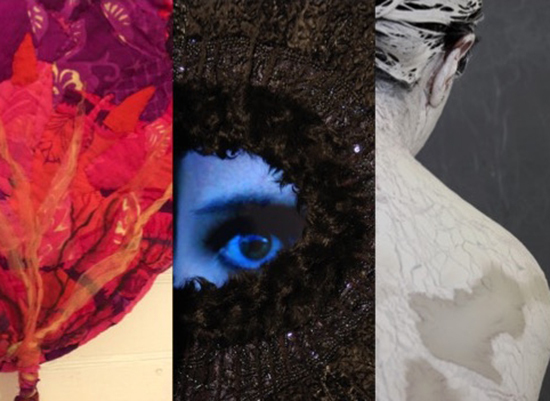 Chalet Comellas, Liz DiDonna and Linda Hall have been selected to create a 3-person exhibition for EYEDRUM that will include sculpture, video and installation. Show curator, Andy Imm will be selecting musical performances to be paired with the works in the gallery’s music space and on the rooftop patio during the opening reception. Constructed from cloth, clay and video each of our works are imbedded with a “sense of the immediate and ephemeral”. We each use a common material of reused garments and textiles to draw upon metaphors and create narratives in our work. Each piece possesses “evidences of memory” to create psychological spaces for the viewer. Ones in which to contemplate the metaphors within the material we use and how those materials can embody emotions. Working with textiles and garments, it is our intent to evoke themes of memory, to create what Linda calls, “containers of the spirit”. We have come together to create spaces that embody unfamiliar and elusive intensities, examining a humanity that resides in objects. The resulting work aims to provide the substance of things both feared and hoped for, the evidence of things unseen. Established in 1998, Eyedrum is an art gallery, exhibition and performance venue, and community space. This non-profit organization became a key community resource by supporting and presenting works of art covering a broad range of sensibilities with an emphasis on the experimental: new forms and work that is not widely presented elsewhere.